Heads up! This recipe for activated charcoal drawing salve is sponsored by iHerb and Nature’s Way, they have a special offer for Garden Therapy readers at the end of this post. 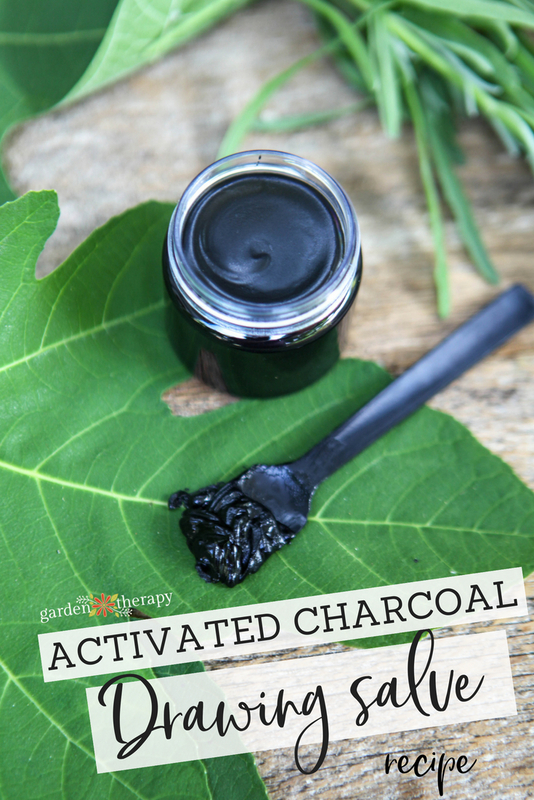 What the heck is activated charcoal and why would you purposely make a black salve to rub on your skin? Before I answer that, I’ll share an even crazier story with you. 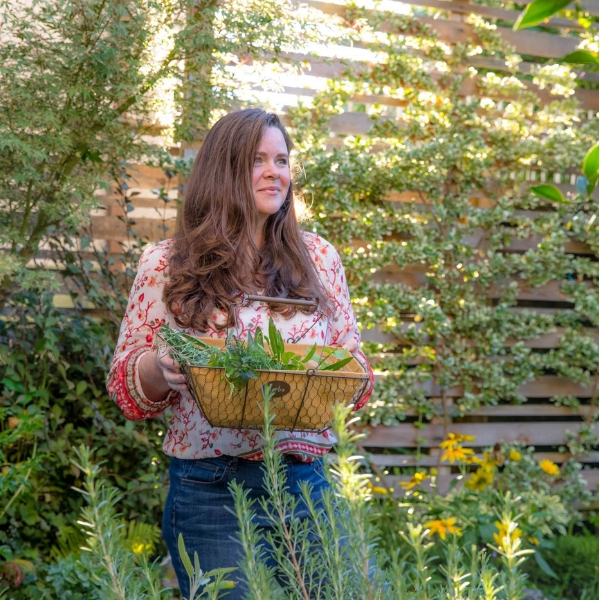 If you’ve been following along on Garden Therapy you’ll see that I have a number of different recipes and garden ideas to keep away mosquitoes. I really hate mosquitoes. I’m one of those sensitive people who has a strong histamine reaction to the bites. I don’t just get an itchy little raised bump. I get a big red swollen blotch that takes every ounce of my willpower not to scratch like I’m going bananas. So here’s the crazy part. 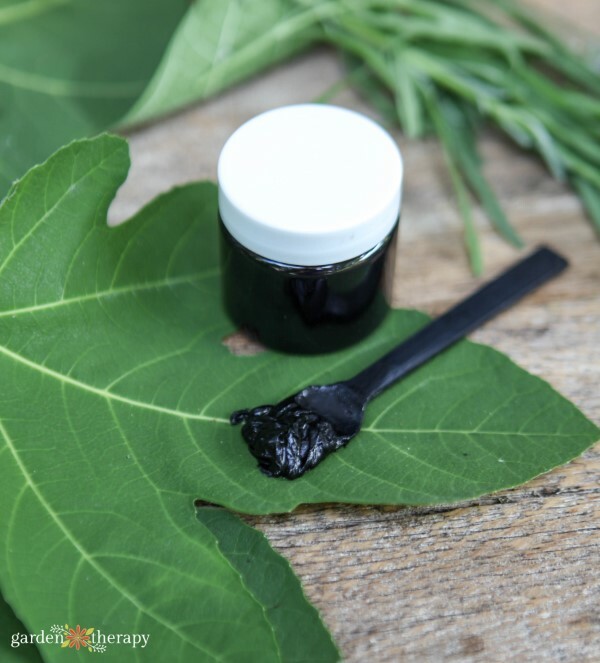 To test out this recipe for activated charcoal drawing salve, I actually invited mosquitoes into my house and allowed them to bite me! And am I ever glad that I did. 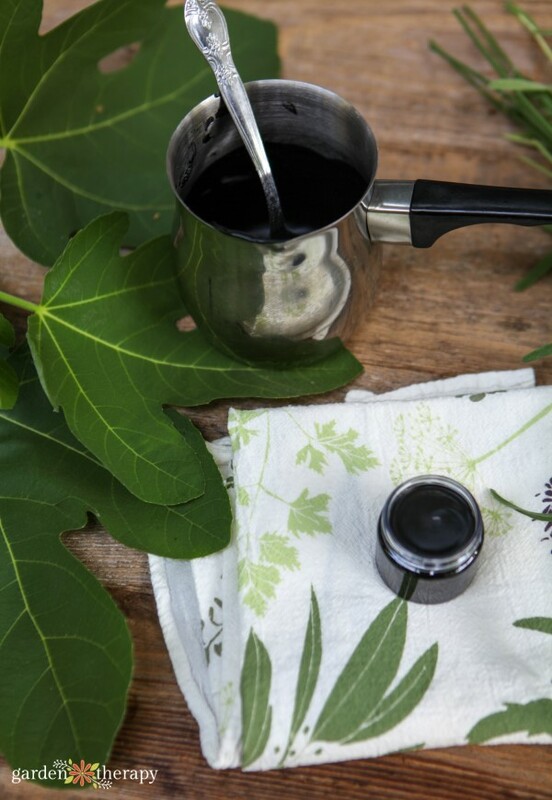 A drawing salve is a mixture of oils and herbal ingredients that work to draw toxins from your skin and can be used on mosquito bites, wasp or bee stings, blisters, boils, slivers, and minor infections. 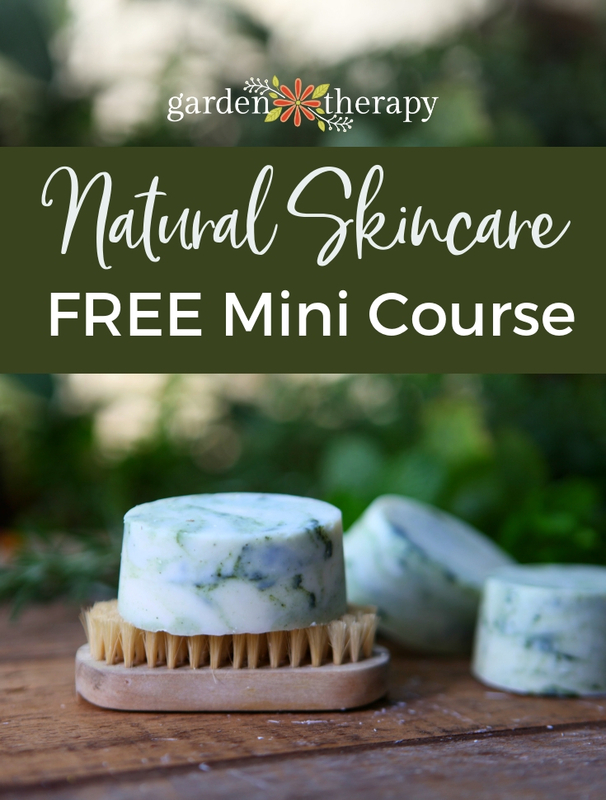 Activated charcoal and bentonite clay are very effective at sucking up toxins but, not surprisingly, they will leave your skin dried out after use. As I mentioned, this post has been sponsored by iHerb and Nature’s Way, who also provided me with all of the oils to make the remedies. 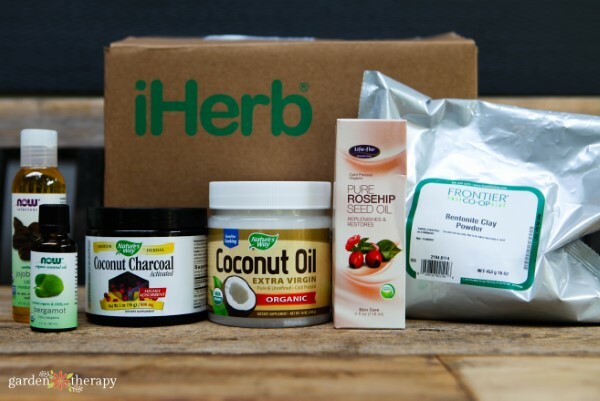 iHerb carries over 400 Nature’s Way products that can be shipped to over 160 countries. Their Customer Service team provides support in 10 languages! I am also participating in the iHerb affiliate program designed to provide a means for us to earn a small commission on sales. But they also have something just for you! Customers can get a discount off their iHerb order by clicking here. All of the opinions and recipes are my own. 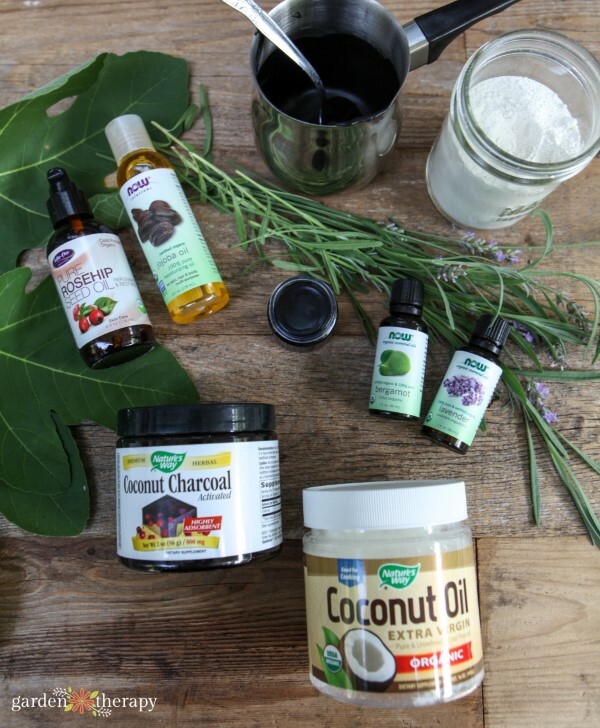 As I was scrolling through iHerb to order Nature’s Way Coconut Charcoal, I noticed a few ingredients I had saved on my Account List: rosehip seed oil, jojoba oil, and bergamot essential oil. Then a light bulb came on. I should add some skin-healing ingredients to test in my drawing salve! I quickly updated my order to include both drawing and healing ingredients to test a new salve recipe. The key was not to choose ingredients that will absorb deeply into skin, but instead those that help to repair the surface of the skin. My order arrived after just a few days (I wrote about how easy their international shipping is on the last recipe I made from iHerb) and I made up my usual drawing salve recipe with the new additions. That’s when I invited the mosquito to the party. I got a nice big bite on my arm and watched it swell up. I scratched it a few times (which is totally against my number one rule for keeping mosquito bites under control: do. not. scratch.) As you can imagine, it was quite swollen and itchy, so I applied my new and improved activated charcoal drawing salve and covered it with a bandage. It was moderately itchy for the next 30 minutes while I went to sleep but it didn’t keep me awake. When I woke up the next morning I took off the bandage and washed off the drawing salve and the bite was completely gone. Not even a tiny bump was left. I’ve made a few other variations of drawing salve using activated coconut charcoal and bentonite clay and I found that they definitely take away bites and infection, but they leave a little bump behind for a few days. And while the bite is no longer itchy, my skin feels dry. But my new recipe took the bite inflammation away completely and made my skin feel fantastic. Besides mosquito bites, I’ve been using this drawing salve on minor scrapes and cuts that have become inflamed to reduce infection. I asked my hubs if he would try and get a wasp sting but he wasn’t biting. And nether were the wasps. But as soon as someone around here gets stung, I’ll keep you updated! Here are the ingredients that I picked for the healing salve and the reasons why I chose each one of them. Certified Organic Jojoba Oil – actually a wax (not an oil); the closest to our own skin’s sebum so it is gentle and won’t clog pores. Weigh the ingredients on a small kitchen scale. 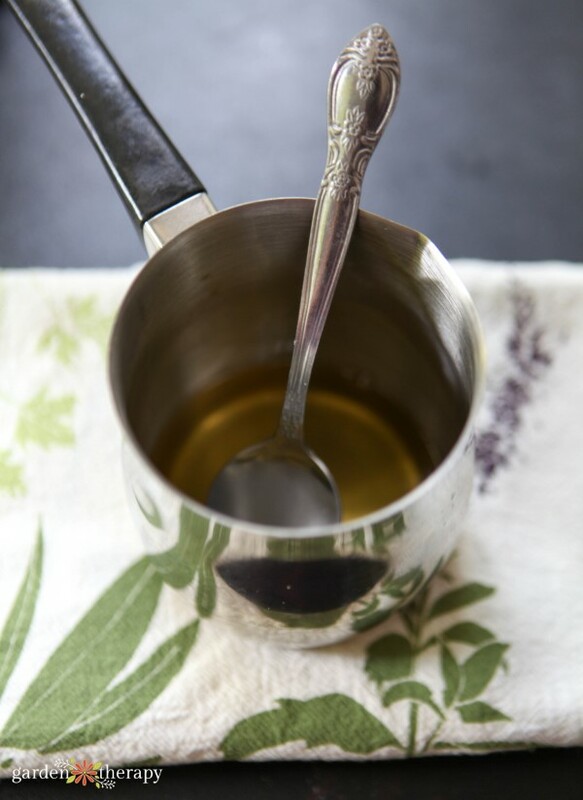 In a double boiler, slowly heat up the coconut oil, jojoba oil, and beeswax until just melted. 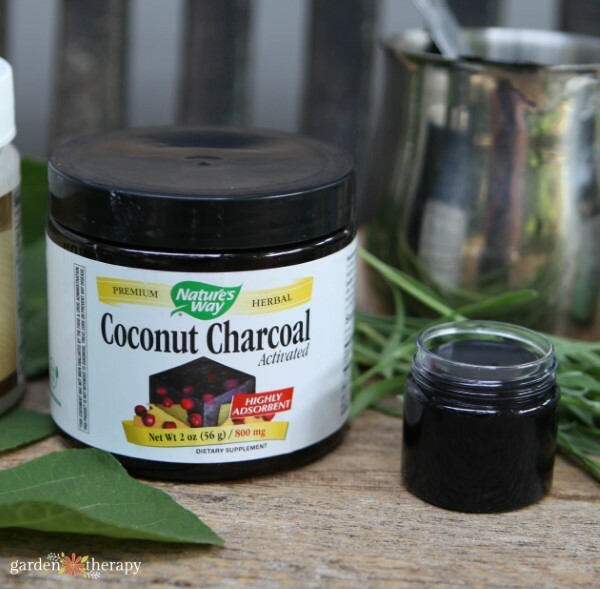 Remove from the stove and add the bentonite clay, coconut charcoal, and essential oils. 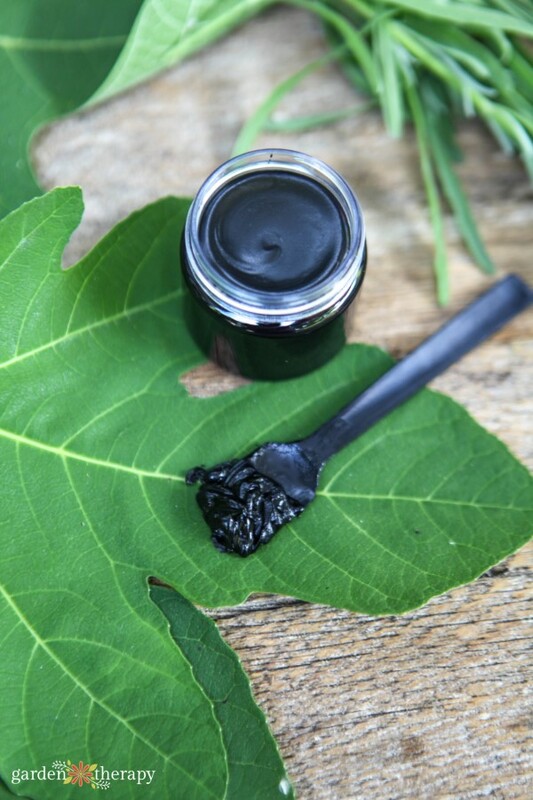 Pour the activated charcoal drawing salve into a glass jar or tin and let cool before using. Use a small spatula or spoon to remove the salve from the jar to avoid adding in contaminants from your fingers (the spoons you get from tasting gelato work perfectly!). Apply a small amount to the skin and cover with a bandage. Leave on for up to 12 hours. I also use this recipe as a face mask and it makes my skin feel lovely afterwards! 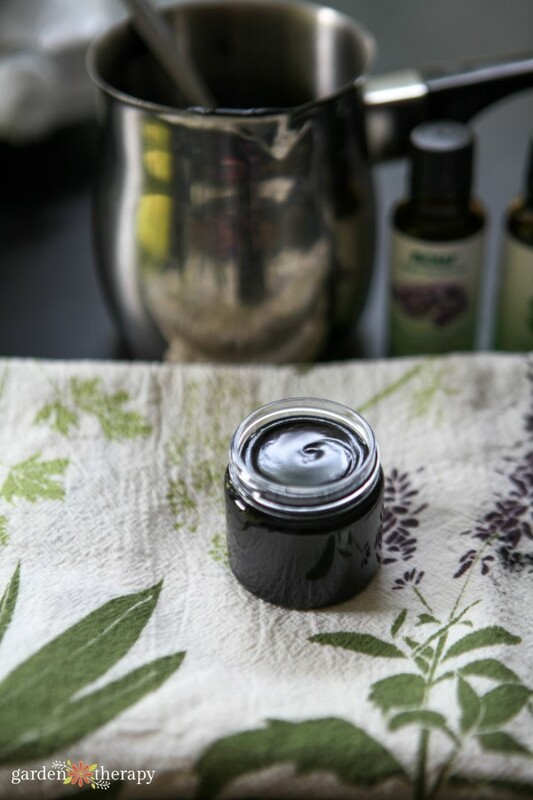 Want to make some of this magic salve for yourself? Pick up all of the ingredients you need from iHerb. Customers can get a discount off their iHerb order by clicking here. My husband has had a bumpy rash on the inside of his wrist for the past week. This morning he applied a little of the salve and then put a bandaid over it and by dinner time the rash was gone! It works like magic and smells amazing. I would love to try this. How long do you think it will keep once it’s prepared? Hi Beth, it should last at least as long as the oil expiry dates that you use. That’s my rule of thumb. Hi you say in the instructions to add olive oil but there is no olive oil in the ingredients? Thanks! Hi Linnea, that was a typo. No olive oil in this recipe. Thanks for letting me know!